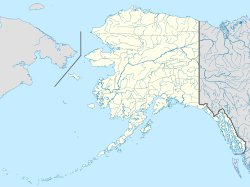 The Aleutian Islands ( /əˈljuːʃən/;   Russian: Алеутские острова; Aleut: Tanam Unangaa, literally "Land of the Aleuts", possibly from Chukchi aliat, "island"), also called the Aleut Islands  or Aleutic Islands  and known before 1867 as the Catherine Archipelago, are a chain of 14 large volcanic islands and 55 smaller ones belonging to both the U.S. state of Alaska and the Russian federal subject of Kamchatka Krai. 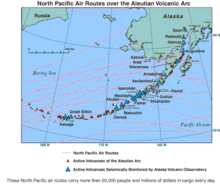 They form part of the Aleutian Arc in the Northern Pacific Ocean, occupying an area of 6,821 sq mi (17,666 km2) and extending about 1,200 mi (1,900 km) westward from the Alaska Peninsula toward the Kamchatka Peninsula in Russia, and mark a dividing line between the Bering Sea to the north and the Pacific Ocean to the south. Crossing longitude 180°, at which point east and west longitude end, the archipelago contains both the westernmost part of the United States by longitude ( Amatignak Island) and the easternmost by longitude ( Semisopochnoi Island). 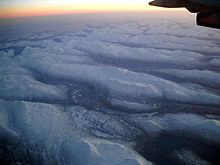 The westernmost U.S. island in real terms, however, is Attu Island, west of which runs the International Date Line. While nearly all the archipelago is part of Alaska and is usually considered as being in the " Alaskan Bush", at the extreme western end, the small, geologically related Commander Islands belong to Russia. All five are located between 51° and 55° N latitude and 172° E and 163° W longitude. The largest islands in the Aleutians are Attu (the farthest from the mainland), and Unalaska, Umnak, and Unimak in the Fox Islands. The largest of those is Unimak Island, with an area of 1,571.41 mi2 (4,069.9 km2), followed by Unalaska Island, the only other Aleutian Island with an area over 1,000 square miles (2,600 km2). The growing season lasts approximately 135 days, from early in May until late in September, but agriculture is limited to the raising of few vegetables. With the exception of some stunted willows, the vast majority of the chain is devoid of native trees. On some of the islands, such as Adak and Amaknak, there are a few coniferous trees growing, remnants of the Russian period. While tall trees grow in many cold climates, Aleutian conifers — some estimated to be two hundred years old — rarely reach a height of even 10 feet (3 m), and many of them are still less than 5 feet (1.5 m) tall. This is because the islands, much like the Falklands and other islands of similar latitudes, experience such strong winds that taller trees are vulnerable to snapping off. Instead of trees, the islands are covered with a luxuriant, dense growth of herbage and shrubs, including crowberry, bluejoint, grasses, sedges, and many flowering plants. There are areas of peat bog near the coasts. Endemic plants include the endangered Aleutian shield fern. On the less mountainous islands, the raising of sheep and reindeer was once believed to be practicable. There are bison on islands near Sand Point. Sheep raising seems to have died off with the advent of synthetic fibers, which lowered the value of wool. During the 1980s, there were some llama being raised on Unalaska. The current economy is primarily based on fishing, and the presence of U.S. military. The only crop is potato. Chickens are raised in barns under protection from the cold. The native people refer to themselves as Unangan, and are now generally known by most non-natives as the " Aleut". The Aleut language is one of the two main branches of the Eskimo–Aleut language family. This family is not known to be related to any others. The 2000 U.S. Census recorded a population of 8,162 on the islands, of whom 4,283 were living in the main settlement of Unalaska. After the American purchase of Alaska from Russia in 1867, further development took place. New buildings included a Methodist mission and orphanage, and the headquarters for a considerable fleet of United States revenue cutters, which patrolled the sealing grounds of the Pribilof Islands. The first public school in Unalaska opened in 1883. During World War II, small parts of the Aleutian islands were occupied by Japanese forces, when Attu and Kiska were invaded in order to divert American forces away from the main Japanese attack at Midway Atoll. The U.S. Navy, having broken the Japanese naval codes, knew that this was just a diversion,[ disputed – discuss] and it did not expend large amounts of effort in defending the islands. More than 90 Americans were taken to Japan as prisoners of war. Most of the civilian population (over 800) of the Aleutians and Pribilovians were detained by the United States in camps in the Alaska Panhandle. During the Aleutian Islands Campaign, American forces invaded Japanese-held Attu and defeated the Japanese. American and Canadian troops later launched an invasion of Kiska, but Japanese forces had already withdrawn, ending the campaign in the islands. ^ Holbrook, W. S.; Lizarralde, D.; McGeary, S.; Bangs, N.; Diebold, J. (1999). "Structure and composition of the Aleutian island arc and implications for continental crustal growth" (PDF). Geology. 27 (1): 31–34. doi: 10.1130/0091-7613(1999)027<0031:SACOTA>2.3.CO;2. Retrieved 30 July 2018. ^ Rodionov, S.N. ; Bond, N.A. ; Overland, J.E. (November 2007). "The Aleutian Low, storm tracks, and winter climate variability in the Bering Sea". Deep Sea Research Part II: Topical Studies in Oceanography. 54 (23–26): 2560–2577. Bibcode: 2007DSRII..54.2560R. doi: 10.1016/j.dsr2.2007.08.002.